Sample unit with 90 days warranty. 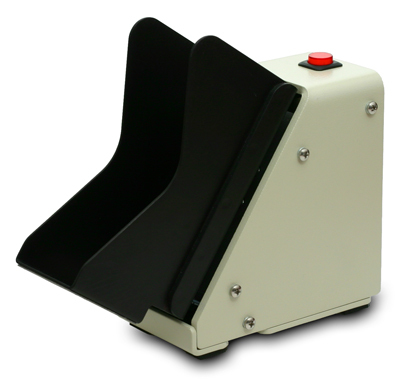 The Shear Tech MJ-1000 check jogger is a small, table-top, automatic check jogger. Now with reduced noise level (<53 dBA), increased stability and the same excellent performance. An important part of any Check 21 Branch Item Capture solution. The importance of check joggers in check processing centers has been known for many years. Jogging a batch of checks for a few seconds with a check jogger, perfectly aligns bottom and side edges of checks which reduces chances of check jamming and double-feeding. We designed our MJ-1000 Check Jogger specifically for smaller banks, branches, community banks, and credit unions, with lower volume of checks. Efficient and Reliable. Takes less than 8 seconds to reliably jog a batch of checks. Quiet operation. Noise level is less than 53 dBA. Jogging tray capacity - up to 250 checks. Very small size (2.8" (W), 6.4" (H), 7.4" (D). One-touch, automatic, timer controlled operation. Automatic or manual control of jogging time.